As is so often the case, the second book of a fantasy trilogy is the one with lots of travelling. They are often my favourite and I was not disappointed here. We get to see much more of the world, learn more about the rich cast of characters and slowly learn more about what the hell is actually going on (though still leaving the reader with many questions leading into the last book). 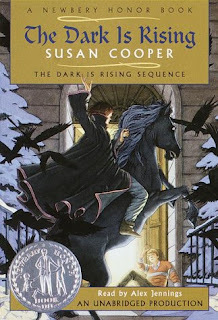 This is book 2 of the much loved YA British fantasy series (also called "The Dark is Rising"). I started on it this summer and struggled with it for several months, taking it on trips and never opening it. But I finally buckled down after the xmas break. It's a good read in the end, but it just dumps so much of its own mythology on you that I couldn't keep interested. Basically, young Will, who is part of a big, happy British family in the country is now also a sort of chosen one (an Old One) in the eternal fight between the Light and the Dark. The first book took place during their summer vacation. This one happens at their family home in a small village at the height of the Christmas season. Will learns more and has to fulfill a bunch of small but dangerous quests. What really works in the book is the setting and what happens there. As Will learns more about the struggle he is invovled in, he moves back and forth in time, all the while the Dark mounts a vicious attack against the Light (and against his village and by extension all of Britain). The attack begins with an endless heavy snowstorm. So you get the battles and quests on the fantastic front all the while the regular people are struggling with all the effects of the weather. For me, I wish the book had been more weighted towards the latter, but I imagine younger readers probably tend to prefer the magical stuff. (It took me decades before I learned to appreciate the deep culture richness and joy of snow removal). I'm not loving it, but it is not really the fault of the book but where my tastes lie today. I shall continue to push forward though. Whew boy, book reading has taken a massive hit and we are at an all-blog low in 2016 of only 18 books read this year! I thought the slide had started much later, but looking back it all starts with the birth of my daughter in 2012. That year was my second-best year with 67, but in my wrap-up of that year, I had already noticed a huge drop-off in the last quarter and was not super optimistic for the future. The thing is, while having a child certainly has an impact on one's leisure time, I am not sure that her existence is the real issue here. I do have time to read, but I don't do it. Most of my leisure time this year was taken up in food preparation of one kind of another, watching sports and worse zoning out slackjawed on twitter for hours at a time. I don't even really participate in the online gaming community anymore, but somehow when my brain is exhausted, social media responds to some kind of short-term appetite in a way that reading books just can't compete with. If I could even cut my twitter-fritting in half with reading, I would be a long way back on track. Anyhow, enough self-indulgent whinging. I did get a nice jolt over the xmas holidays with some fun Jack Reacher and the first of the First Law series and I have a new energy and will to read more this year. Once I do get stuck on a book, I can pretty much plow through it. It's the getting stuck part that I need to work on. Another thing is that I did read quite a lot of comics this year. I have a hard time considering them as a book and so don't count them anymore, but it was reading (and most in french, so that's worth something). I discovered that my local library (where I have been taking my daughter a lot) has a pretty decent bande-dessinée selection. I am working my way through the works of Jodorowsky (L'Incal a classic that I never understood when it was in Heavy Metal and Les Technopères which was awesomely trippy), discovered Margeurite Abouet (first with Bienvenue but then Aya which is just great) and am also working on the managa Soil. I'm not a big manga fan (I know, I know, it's not a genre, but Japanese comics are consistently littered with certain trademarks that really take me out of the immersion) but this one is a pretty engrossing and fucked up story about a designed town that goes bad. Maybe if I finish an entire series or ouevre of one artist/author I will consider that a book and add those as write-ups this year. My apologies for my absence to those of you with whom I used to interact in the online book reading world in the past. My relationship with the internet is getting weird, as I suspect it is for all of humanity these days. We shall see.